Yesterday, 8 November, saw Danny Biddle as the opening witness at the 7/7 Inquest with regard to the Edgware Road incident (Factual Issue 3: Circumstances at each of the four scenes immediately following the explosions). "Daniel Biddle: I was just 6ft from 7/7 bomb as it maimed me"
"7/7 survivor describes moment he saw terrorist leader detonate bomb on London tube"
"London bombings survivor saw bomb detonated"
However, there is more to the headlines than meets the eye, and more than might be gleaned from the media reports of Mr Biddle's testimony. A. [DANIEL PAUL BIDDLE] No, I mean, there was nothing about him that made me think he was dangerous in any way or anything like that. If there would have been, I would have got off the train and got help. I mean, he was just a -- he looked like a normal guy going to work within London, whatever he did, and there was nothing that he did that made him stand out different to anybody else at that particular moment in time. Q. [MR KEITH] Do you recollect him carrying anything? A. He had a rucksack, like a small, black camping rucksack. Q. Was he holding it or carrying it in a particular way that you can recall? A. I remember it being on his lap. Q. Mr Biddle, not unsurprisingly, the story of how you survived the bomb at Edgware Road has been widely reported in the press and around the world and a number of reports have purported to give accounts of your experience and memories of that day, and in those accounts there are repeated references to the possibility that the man might have been wearing a rucksack on his back, and that is what you recollect. A. I've said all the way along from the very first statement I gave to the police he had it on his lap. Q. Did he have one rucksack or two, or one or two bags? Was there anything else that he was carrying? A. No, I just saw one rucksack. Q. Can you tell us a little bit more, if you can, about the size of it? [MR BIDDLE] The train entered the Tube tunnel, I looked round, as I looked round, he looked up, I just saw a quick movement, then there was just a big, white flash, the kind of noise that you get when you tune a radio in, that kind of white sound, and it just felt like the carriage I was standing in filled -- just expanded at such a vast rate and contracted quickly and, with that, it blew me off my feet and through the carriage doors into the tunnel. Q. [MR KEITH] When you say you saw a quick movement, what do you think was the movement that you saw? Was it some part of his body, or was it a movement in the bag? Q. Because these proceedings can't record what you've shown us, did you just demonstrate that you saw an arm move somewhere near the rucksack? Q. Did you see what precisely moved or whether there was any movement in the rucksack itself? A. Literally, as soon as his arm moved, I was outside the carriage. Q. Do we take it from what you've said that the rucksack was still on his lap, or was it on the ground? A. When he made the arm movement, the rucksack was still on his lap. Q. Were you able to discern any sort of expression or any sort of look on him at that moment? remember hearing. He just put his head down, moved his arm and, the next thing, I'm outside the train. Q. What was your first conscious thought after that? MR SAUNDERS: Mr Biddle, I will be equally short. You have described to Mr Keith seeing Khan's arm moving quickly. In your statement in December I think you gave a little more detail where you thought you'd seen him with a white cord at the rucksack? Q. That's what you thought was being pulled? The details emerged for the first time as a forensics expert's evidence was read at the trial of three men accused of helping to plan the atrocity. Jurors were told the "unique" bomb mixture was made up of black pepper and hydrogen peroxide, which was put into ordinary plastic bags alongside ice-packs to cool the volatile material. The bombers were not wearing the rucksacks at the time of the explosions, but had instead put them down on the floor of the bus and Tube trains, it was claimed. Neil Flewitt, QC, prosecuting, said that expert Clifford Todd had examined the wreckage of the bomb sites. He said: "It is, in the opinion of Mr Todd, noteworthy that at each scene, some personal materials and documents, such as ID cards, were found relating to the bombers. "Although they were damaged to some extent, they did not show the damage that would be expected if they were on the body of the bomber or in the rucksack, suggesting that in each case they had been deliberately separated by some distance from the actual explosion." The problem that the Inquest now has is that of squaring the testimony of Mr Biddle -- an eye-witness sighting of a detonation by pulling "a white cord" on "a small, black camping rucksack", of which Mr Biddle remembers "it being on his lap" -- with the official version of the story that states the explosion occurred on the floor of the carriage. No doubt Mr Biddle's testimony will be forgotten by the media once the Inquests move on to discussing matters pertaining to the forensics at the scenes, the types of explosives used, and the method of detonation. 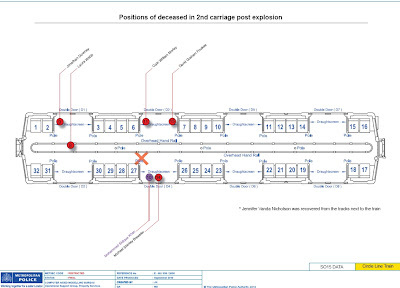 Until then, caution should be exercised with regard to any evidence that attempts to prove that the damage to the Edgware Road train, seen in the image below, was caused by mixing Hydrogen Peroxide with black pepper/masala spice. A comment on this image can be read here. As the Inquest approached the end of the third and final week of testimony and evidence into the Aldgate scene, as outlined in 'Factual Issue 3: Circumstances at the scene immediately following the explosions', the first evidence for the presence of Shehzad Tanweer at the site of this explosion emerged. 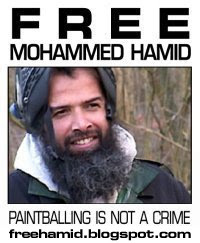 The evidence didn't come in the form of CCTV footage, as we now know it was claimed that the last sighting of Tanweer was made at around 08.26.32 at the King's Cross Thameslink end of the entrance tunnel to the London Underground. Nor did the evidence come in the form of witness testimony. Not one witness on carriage two claimed to have seen Tanweer on the carriage. 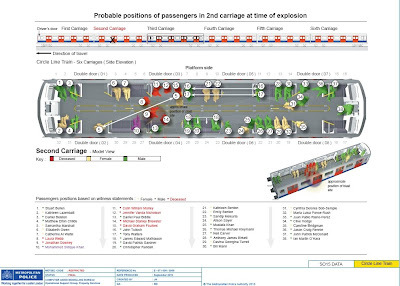 Bruce Lait, for example, who had given interviews to the press in the days after July 7th 2005, and who had claimed he hadn't seen anyone where the hole in the floor of the carriage was, was not asked whether he had seen Tanweer on the carriage before the explosion. Q. Did you, in fact, tell the police that you did recollect -- and you had an image in your mind to this effect -- a male standing inside the rear set of doors in that second carriage? A. I do indeed, and it puts a shiver through me to remember that. However, I couldn't say with great detail his features, etcetera. It's more those soft focus of the people that you normally see on the Tube and haven't paid attention to. Q. Could we have, please, on the screen INQ00008352, page 2? 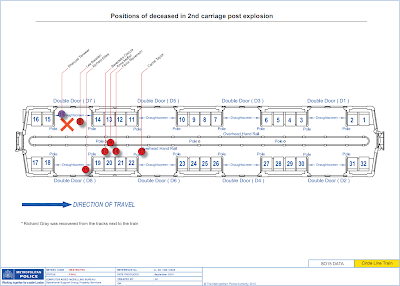 Did you prepare, in fact, a sketch map for the police showing the rear of the second carriage towards the top of the page, towards the front of the train,towards the front, and the platform side which you boarded, and then the third carriage, and you went on,and do the two crosses indicate respectively the person whom you thought you might have seen as being significant in the second carriage and then your place in the third carriage? A. Indeed. The cross circled is obviously where I perceived Tanweer to be. Q. You obviously didn't know him to be Tanweer then. Did you tell the police that you saw a man you described as an Asian man wearing some sort of white or cream light-coloured clothing in any event? A. That's what I recall, yes. Q. Can you recall any more about the person that you saw in outline as you boarded the train? A. I would be hesitant to say more because of all the subsequent information I've seen. Q. Of course. Do you recall whether he was carrying anything, the person that you recall seeing? A. I remember him holding something, but how he was carrying it, again, it would be wrong of me to try and put detail on that. Of course the 'suicide-bomber' meme has always tacitly implied that explosives are carried on the body. Although, uniquely it appears, as the story of the London bombings evolved, rucksacks on the body became solely the mode of transportation of the explosives, not the method of delivery. At the time of the attacks the Metropolitan Police were clearly stating that the explosions happened on the floors of the carriages, with early reports claiming the explosions came from under the trains, yet this did not dispel the 'suicide-bomber' meme once the four accused were identified. 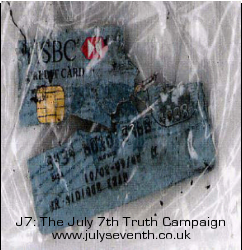 This is important to bear in mind when examining any witness statements or evidence which originate from the period immediately after the events of 7 July 2005. "I am a detective constable attached to the Anti-terrorist Branch at New Scotland Yard where I performed the role of Terrorist Forensic Scene Examiner and Exhibit Officer. "On Thursday, 7 July 2005, I was on duty when a series of incidents took place in London. 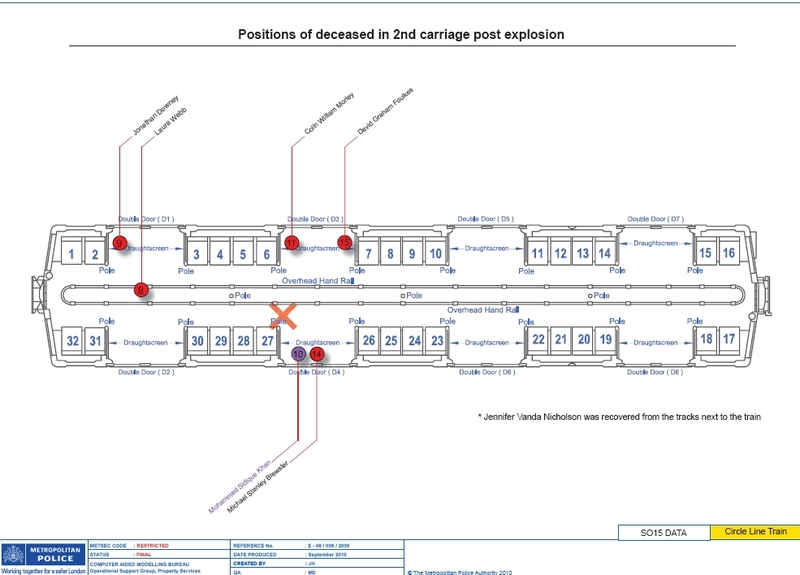 I was aware that initially there had been explosions on London Underground trains at Russell Square,Edgware Road and Aldgate Underground station. A further explosion had occurred on a London Transport bus at Tavistock Square. "I was tasked by DS Michael Jolly to act as the Deputy Scene Examiner to DC Andrew Meneely, who had been tasked earlier in the day to attend the scene at Aldgate London Underground station. Anti-terrorist Branch Bomb Data Centre and exhibited at NF/7." "During the course of DC Meneely's initial examination of the scene, he seized exhibit AM/11, selected debris from zone 5, the open area to the left of carriages 1, 2 and 3 of the train. "The exhibit contained part of a wallet which appeared to have been close to an explosion. I examined the contents of this wallet and found that it contained fragments of plastic cards, fragments of Bank of England notes, business cards, and other correspondence. "I recorded the following details in the 'Remarks' column of the exhibit book and passed them to the control vehicle for transmission to the ATBIU. 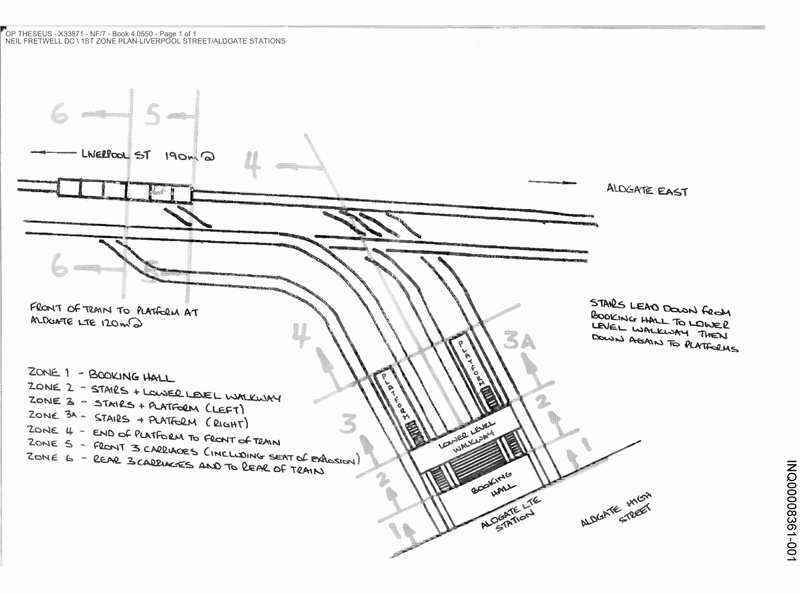 "On Monday, 11 July 2005, I conducted a closer examination of exhibit AM/11. A decision had been taken to submit the wallet to the Forensic Explosives Laboratory for explosive trace work to be done. I therefore opened the exhibit and removed all of the fragmented parts from it. I then resealed the exhibit. "I also produced exhibit RABH/11 - one nylon bag - for control purposes for the Forensic Explosives Laboratory." 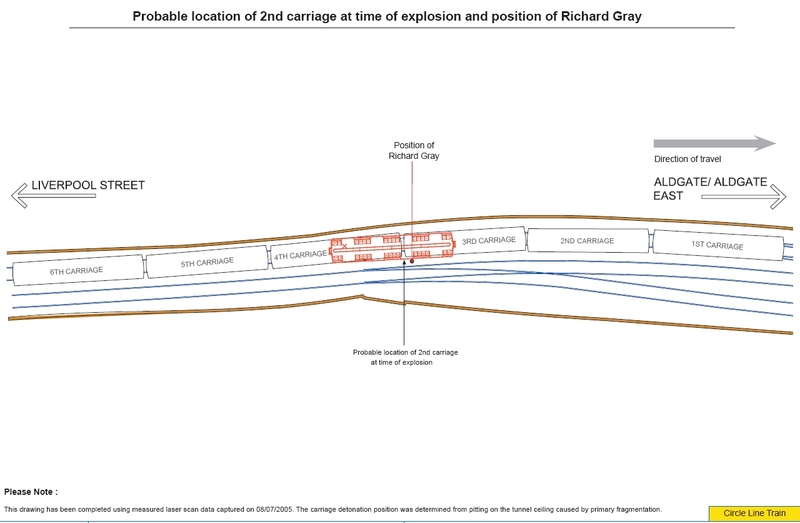 Richard Gray was tragically blown out of the right-hand side of the second carriage, that's to say the right-hand side of the carriage if you were standing in that carriage looking forward in the direction of travel on the side away from the bomb and on to the track, so from this diagram away from the location of the bomb down towards the bottom of the page and through double door D8. Because the train carried on moving for a short while, as I've said, his body was found adjacent to carriages 3 and 4 when the train finally stopped. 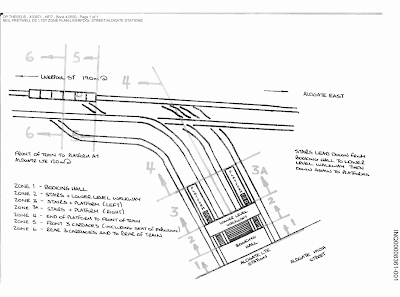 Rather strange then that Zone 5 didn't include at least part of carriage 4. The total number of deceased from Circle Line train 204, according to all witness testimony and evidence was seven - a figure which does not allow for the presence of Shehzad Tanweer. 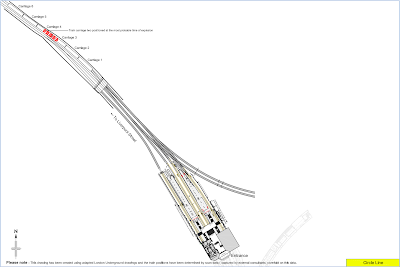 We also know that no victims of the Liverpool Street/Aldgate incident had died in hospital. Q. [Hugo Keith] At 10.18, you made your final call, for these purposes -- you updated BX, in fact, for the rest of the morning, but for our purposes, you made your final call at 18.47, [BTP170-55]: "BQ10 ... for your information, Aldgate, I'm the last police officer to leave and I've got the last Fire Brigade with me ... the station's now evacuated to the front gate. I can confirm 7 ... dead bodies left on the train, over. "Sorry, say again? "Have you got any persons trapped, over? "None that's still alive, over." That was at 10.18. Before you left, had a doctor appeared trackside? A. [Inspector Robert Munn] Yes, I think it was the -- I think it was the HEMS doctor that I referred to earlier, I think. A. I didn't -- I can't recall his name, sir. Q. You didn't catch his name. Did he formally confirm to you that there were seven dead? A. Before we left, sir, I waited by the doctor and the lead fire officer, while the doctor checked all the remaining bodies that had been left behind, and confirmed the number of dead. "When all known live patients were removed,the HEMS doctor pronounced life extinct the seven patients left..."
Q. [MS SHEFF] Can I just repeat that? I just want to clarify that, when you describe seeing a body under the doors near X, that's the one that you've marked on as C on your plan. A. [DR LOCKEY] Yes, I think so. Q. In your witness statement, you described that body as a black or dark-skinned male of Somali appearance. A. That is not the statement that I wrote. That was a statement that a police officer wrote for me, although I obviously agreed it afterwards, and I wouldn't describe anyone as coming from a particular country. However, in the discussion, he asked me about the colour of the man's skin and whether I thought he was Asian or whatever, and that's how we got to someone of slightly more North African appearance than perhaps Asian appearance. But it was not something that I would have stated myself, if I'd written the statement. Q. Okay, so thinking about that now, can I ask you this: have you previously seen victims of explosions with blast injuries? Q. -- which can turn the skin black. A. I work in a Burns Unit as well. appearance of somebody with black skin? A. Yes, I felt that that was the case, and I recall seeing a head underneath the window of a door, the door had been blown on to it, and I may have been mistaken, but I didn't feel that that patient was white and I am used to seeing patients with blast injuries. Q. So that was the impression that you had? Q. I suggest that you were mistaken about that. The X actually does mark the site of the explosion and the fact that the body was so close to that explosion does indicate, we believe, that the body received those juries from the charring of the skin as a result and that Lee Baisden was that man who was close to the original site of the injury. You don't take that view, I suspect? A. I can't be certain either way. I have thought about it since and I came back to my original conclusion. Q. It was, however, a scene of total carnage and body parts were all over the place, and it must have been quite traumatic just taking in the scene when you first saw it. So is there a possibility that you are mistaken about that? A. There is a possibility. Dr Lockey then continues in his testimony to state that he certified five dead on the train and that there were two deceased on the tracks. A. You could tell how many bodies were there, but it was quite difficult to tell exact, you know, body parts from each other due to clothes being on the area, blast matter, and the positioning of the bodies. It was quite easy to assign how many individuals were there, but just picking out exact details was difficult. Dr Costello is then taken through the names of the seven victims, minus Shehzad Tanweer. DC Andrew Meneely, bomb scene examiner at Aldgate, gave his testimony on the morning of the 3rd November describing his role as "to do the forensic recovery of any evidence at the scene and to deal with any body recovery of bodies that may be there" (p67, 12-14). [NB. At this point Hugo Keith reminds the Inquest that "the issue of the bodies and their recovery and their treatment is outside the scope of these proceedings by order of my Lady earlier in these proceedings" (ibid. 15-17)]. Q. [MR SAUNDERS] I think there was also a problem with the obtaining of a correct vehicle that had sufficient refrigeration to ensure the proper removal of the bodies? A. [DC MENEELY] Refrigeration units were called for. Q. I think there was a difficulty -- it may be somebody else deals with that, but there were difficulties as to when they could be provided on the scene. A. I understand that the vehicles arrived some time on the Saturday. A. Some time on the Friday, actually. Q. -- on the Friday, I think. Q. So I think there were those two that were outside, Carrie and Richard Gray were removed initially, and then Fiona Stevenson on the Saturday. A. Yes, that's correct. Ms Stevenson -- there was four bodies removed on the Friday, two on the trackside and two males in the rear carriage part and then the three other women on the Saturday. It doesn't appear to be the case, even by 8th July 2005, that any discernible body parts from Shehzad Tanweer had been identified. 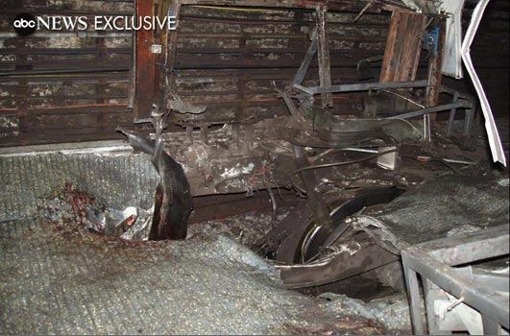 A wallet, some damaged plastic, paper receipts, and membership cards all remained, but nothing identifiable as the head, torso, or limbs of Shehzad Tanweer, appear to have been present, resulting in several confirmations of the total number of dead as 7. Note: 'Suicide bombers' do not generally vapourise themselves (Warning: Graphic image of the remains of a 'suicide-bomber' with explosives strapped to the body, not in a rucksack on the floor). Q. [HUGO KEITH] The process continued, as you've told us, for, in your case, some ten days, but it wasn't until, I think, Saturday, 9 July that a significant piece of bone, a piece of a backbone, was discovered in the front of a rear bench seat in carriage 2? A. [DC MENEELY] That's correct. Officers were searching that part of carriage 2 and, about 9.30 at night, I was told that a piece of backbone had been recovered. Q. Why was that significant? in relation to the upper body. Q. No doubt, the discovery of that piece of bone was relevant to the investigation of the crime and information about it was passed to your colleagues? 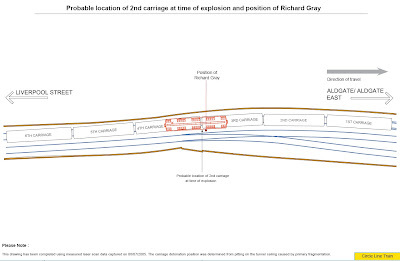 Presumably an upper body trauma would be significant if the explosion had occurred on the body, as is understood to be the case with 'suicide-bombers', but not if the explosion had occurred on the floor of the carriage, as no other victim had this type of injury. 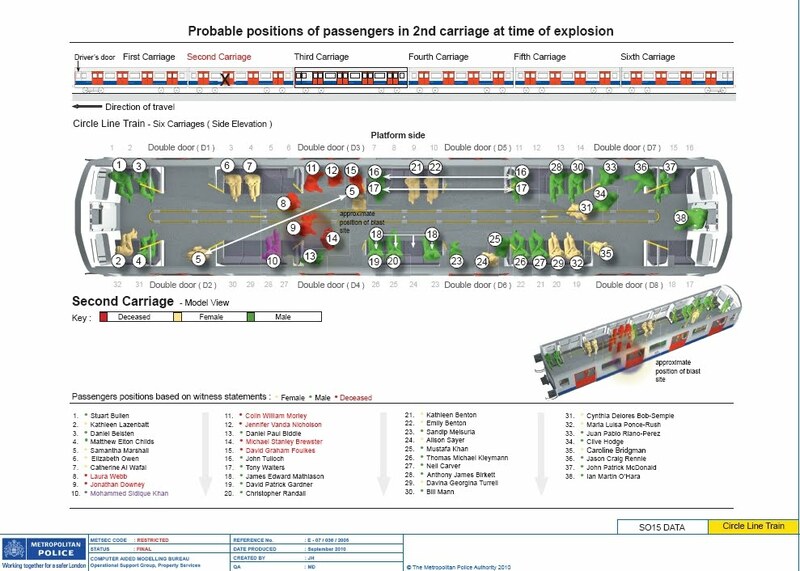 As we can see from this graphic, Lee Baisden whose severely burned body was described above by Ms Sheff, was very close to the centre of the explosion, as were both William Walsh (second degree burns and lacerations from climbing out of the window) and Greg Shannon (a total unknown - no press reports), neither of whom were called as witnesses or had their testimony read. (At this stage we cannot discount the possibility that Hugo Keith will summon them when 'factual issue 9: The presence at the scenes of MSK, Tanweer, Hussain and Lindsay, and their proximity to the explosions' are covered in early 2011. J7 will of course further examine the detail of these issues in due course). Q. [HUGO KEITH] I think also in that area you noticed what seemed to you to be a part of a body. In fact a human spine? A. [DI KEMP] That's what it looked like, yes. Q. From all that, because there was devastation, destruction, debris, a hole, a piece of spine, as well as a body that you realised was dead, and another severely injured person, you knew you were in the immediate vicinity of the bomb? A. I believed that, yes. DI Kemp had previously described the scene as dark and that he had only the use of a bicycle lamp which he had acquired from a passing passenger [ibid. page 37, lines 18-129]. The forensics report into Shehzad Tanweer was read to the Inquest by Hugo Keith, no evidence was published and neither are the actual body parts that tissue for DNA sampling were taken from, named. (Again, these issues may be examined when the forensics evidence is adduced in early 2011). "I hold degrees of Bachelor of Science in Zoology and Master of Science in Forensic Science ... I have been a forensic scientist since 1992. During the course of my career, I have examined many cases using DNA analysis techniques. 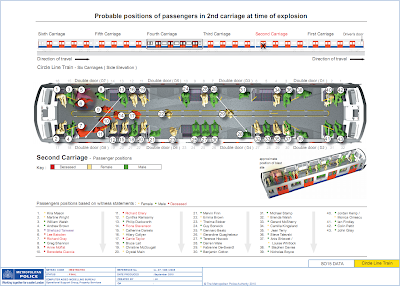 "Between 13 July 2005 and 28 July 2005, 80 recovered body part samples associated with the bombings of a London Underground Tube train at Aldgate on 7 July 2005 together with 20 reference control samples from individuals known to have been present at the time of the explosion were received at the laboratory. All items were received in sealed packages. "I was asked to carry out STR profiling tests to determine whether any of the recovered body part samples received in this case could have originated from Shehzad Tanweer. STR profiling is a sensitive DNA analysis technique. An STR profile obtained from a human body fluid, such as blood or saliva, or human body tissue can be compared with an STR profile of a given person. If the profiles are different, then the body fluid or body tissues cannot have originated from the person in question. "If, on the other hand, the STR profiles are the same, then that individual, and anyone else who shares the same STR profile, can be considered as a possible source of the body fluid or body part. The significance of finding such a match can then be assessed. "Reference control sample. The tissue sample taken from Shehzad Tanweer was used to determine his STR profile. "Tissue analysed from the following recovered body part samples generated full STR profiles which matched at of Shehzad Tanweer." profiles which matched that of Shehzad Tanweer." My Lady, four are listed. "This means that these body part samples could also have originated from him. I estimate that the probability of obtaining these profiles, if the tissue tested from the body parts did not originate from Shehzad Tanweer but came from another unrelated person who, by coincidence, has the same profile, is less than 1:1 billion ..."
My Lady, he lists three of the body part samples. "These body part tissue samples could not have originated from any of the other individuals for whom reference control samples were analysed. None of the other recovered body part samples that were analysed could have originated from Shehzad Tanweer. In my opinion, the STR profile results provide extremely strong scientific support for the assertion that all of the recovered body part samples listed above originated from Shehzad Tanweer." Statement of MR NATHANIEL CARY read "Recovered body fragment: Operation Theseus URN60021972 (Shehzad TANWEER). "This body part was recovered from the Aldgate scene. This is a fragment consisting of the lower part of the thoracic spine and the upper lumbar spine weighing 1.852 kilograms. There are some signs of decomposition and charring. The specimen is contaminated with glass. It is associated with a piece of cloth. "Measurements: 30 centimetres longitudinally. "Up to 14 centimetres wide. "Up to 10 centimetres deep. "I have subsequently seen a copy of a form entitled 'Matched body parts'. This relates to scene 1 Aldgate. Through DNA analysis, this body part, URN 60021972, has been matched to multiple other body parts identified as having come from Shehzad Tanweer. "The nature of this body part and the extreme level of disruption implied by the nature of the other matched body parts is typical of a deceased person having been either in direct contact or very close to an explosive device. "The level of exposive disruption associated with this deceased, when compared with other bodies, both from this scene and other scenes of explosions also occurring on July 7, is entirely in keeping with this deceased having been in possession of the explosive device at the time it exploded. "Cause of death: "A cause of death for this deceased person may be recoded as 1A injuries due to an explosion." How Tanweer could possibly have been 'in possession" of an explosive device that exploded on the floor of the carriage, and how he managed to virtually disintegrate to the point where no discernible body was identified, only adds to the many questions which existed before the 7 July Inquest resumed. Questions which this Inquest is failing to answer.